Last night’s Singles matches proved some very interesting and some predictable results. 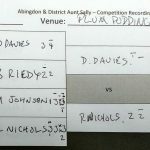 From the Plum Pudding – “with 8 players up and 4 from Berinsfield it was statistically inevitable that some ‘friendly fire’ was going to take place. Dave Davies saw off Paul Ealey and then Brian Reidy (who’d already beat his teammate Stuart Wilson in a 3 leg 3-1-6 stick clincher with two 5’s in the game). Only 5 players turned up at the Spread – Dave Dix beat Brian Adams in the Venue Final. 7 players turned up at Abingdon Utd – Lee Clapton beat John Simmons in the final game.